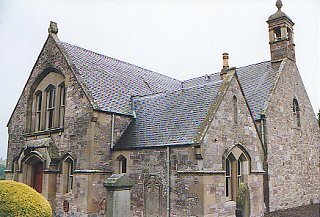 This small village is located 3 miles (5 km) southwest of Kelso and west of the River Teviot in the old county of Roxburghshire. The Roxburgh of today has neither the status nor the location of its predecessor. The modern village was only established in the 17th century and the houses were thatched until the mid-20th century. Its graveyard includes a burial vault for the Kers of Chatto. To the south of the village, in a field, is the ruin of the 16th-century Wallace's Tower and beyond is a fine viaduct constructed in 1847 to carry the railway across the Teviot. The original settlement lay to the west of Kelso, 2 miles (3 km) to the north northeast of the current village, and was created a royal burgh in the early 12th Century, with its castle (Marchmount) used as a royal residence. As a member of the Court of the Four Burghs in the 13th century it was regarded as the fourth most populous and important town in Scotland. The town later passed back and forth between the Scots and the English and was in the hands of the English from 1334 until 1460, when King James II besieged both town and castle but was killed when a cannon exploded. The victorious Scots decided to raze both the castle and town to remove it as a bone of contention. Walter Ker of Cessford was given the property by James IV in 1499 and his successors became the Dukes of Roxburghe in 1707. The site of the castle and town were incorporated as part of the policies of Floors Castle, which was built by the 1st Duke in 1718-25.